A few hundred miles northeast of Great Slave Lake in Canada, there's a small hill that represents the divide between water that flows southwest into the Mackenzie River watershed and water that flows northeast into the Arctic Ocean. The longest of the rivers running northeast to the Arctic is the Back. It flows for 500 miles along 83 rapids and waterfalls without a single dam, mine, or well site diverting water or carving up the treeless landscape. In the summer of 1993, I was in the midst of canoeing from Great Slave Lake to the Arctic Ocean hoping to find the source of the Back River. Hard as I looked from my vantage point on that small hill, I couldn't find the line of whitewater that was supposed to flow northeast from a lake nearby. All I could see in the valley below me was a shallow trickle that flowed intermittently from one tundra pond to another. It seemed as if the long, hot summer we were experiencing had dried up the headwaters of this river. It had been a tough trip, and I was not relishing the idea of having to tell my three companions that we had many more miles of portaging ahead of us to get to the next big lake that spills into the Back. Before they could catch up to me at the top of the hill, however, something moving toward me caught my attention. Looking through my binoculars, I could see the silhouette of two caribou in the distance. The animals looked at me and then back again, as if something were driving them forward. At first, I thought that the wolves we had seen earlier in the day were the cause of their concern, but when the two caribou were followed by ten, then dozens, and eventually hundreds more, I realized that I was wrong. We were about to be stampeded. For three hours, the animals kept coming, clacking and grunting and churning up a cloud of dust that scattered light from the setting sun into a blaze of fiery oranges and reds. It was mesmerizing. In all the years I had been hiking, canoeing, and participating in various wildlife surveys in the Arctic, I had never seen so many animals on the move. Ten thousand? Fifteen thousand? Thirty thousand? 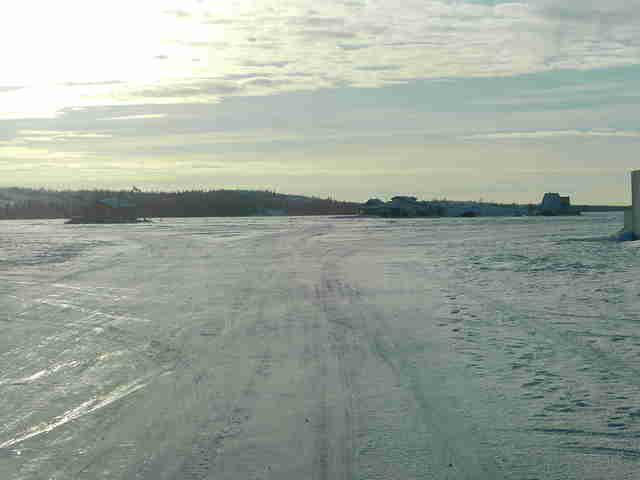 Confronted by so many caribou marching across such a vast space over a short period of time, it was futile to think that any of our estimates were remotely close to being accurate. In the 1.6 million years that caribou have roamed the northern hemisphere, their populations have risen and fallen with cycles of glaciation and deglaciation. In that time, caribou found a way to survive when many other Ice Age animals such as the woolly mammoth didn't. In more recent millennia, populations have ebbed and flowed on a regional basis for a variety of other reasons, not all of them clearly understood. So when the Bathurst herd began showing signs of decline around the time I was on that canoe trip, no one was overly concerned. A few eyebrows were raised in 2003, however, when only a third of these animals could be accounted for. Still, there was no panic. That didn't set in until 2009 when the herd plummeted to just 32,000. Caribou are to Inuit, Dene, and other Arctic people what bison were to the North American Indians. When bison were wiped out on the Great Plains, tribal and First Nations cultures collapsed and never fully recovered. The absence of caribou in a future Arctic would be just as devastating. Four or five caribou can save a family living in a remote village or hamlet between $2,000 and $4,000 annually in food costs. The importance of these animals, however, extends far beyond scales of economy. Visit any community in Alaska, northern Canada, northern Scandinavia, Greenland, or Arctic Russia and you see caribou in the clothes people wear, the stories they write and tell, and the artwork they create. Like the polar bear, the caribou plays a near mythical role in many people's lives. Each time a hunter kills a caribou, an offering is made to God or the Creator. Overhunting, however, is one reason caribou have declined in some places. Until 2009, the annual aboriginal harvest from the Bathurst herd alone was between 4,000 and 7,000 animals. Many of them were cows, which are key to the sustainability of a herd. According to one study, the number of breeding females in the herd fell from 203,800 in 1986 to just 16,400 in 2009. Hunting alone does not account for the freefall, though. What concerns many caribou experts now is the precipitous warming in the Arctic that is adding to the stress that caribou already face in a world in which deep snow, predators, pathogens, insects, and overgrazing limit their numbers. These climate-induced factors include bigger, hotter, and more frequent forest and tundra fires, extreme weather and ice storms, changes in the dates of freeze-up and breakup of large rivers and lakes, which may affect migrations, a new parasitic disease previously unknown in caribou that live in the Great Bear Lake area of the Northwest Territories, and weather conditions favoring insects that torment the animals and prevent them from foraging and gaining the body mass needed to successfully reproduce. 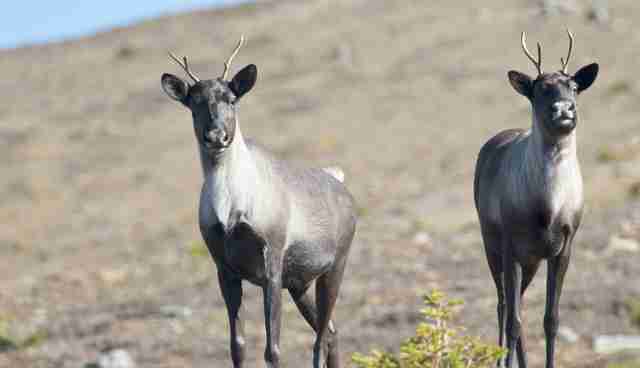 Caribou may be more resilient to climate change than many scientists believe. What they need most is space, especially on their calving grounds. Photo: Edward Struzik. When all is said and done, however, the cheapest and most effective way of ensuring that there will be caribou in a future Arctic is to set aside habitat before industry has a chance to come in, carve it up, and tear it apart. 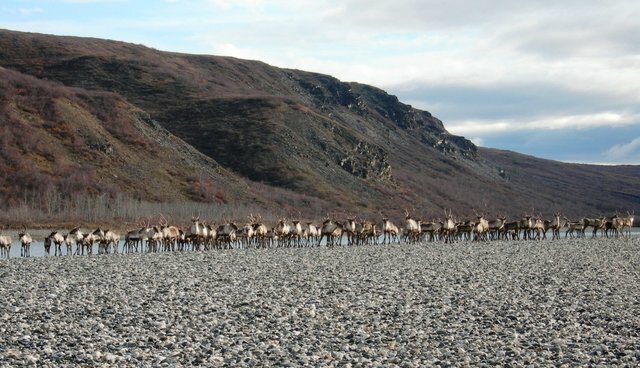 The population of the Porcupine caribou rebounded thanks, in part, to indigenous hunters on all sides of the Alaska, Yukon, and Northwest Territories borders who agreed on hunting restrictions. It's doubtful that this population would have come back had energy companies been successful in their efforts to drill in the Arctic National Wildlife Refuge of Alaska as they have been trying to do. Protection of those calving grounds as well as those in Ivvavik National Park means that there's one less thing stressing these animals. The past tells us that caribou were more resilient than Ice Age animals such as the woolly mammoth, which was well equipped to deal with the Arctic climate. That's not to say that new anthropogenic stressors are not a threat. There is no denying that caribou are currently losing ground, but it does appear that they are more adaptable than we acknowledge. Unlike the ice that polar bears rely on, caribou habitat is vulnerable to something that we have a bit more control over. Given the space that they need, caribou could and probably will be an important piece of the ecological puzzle in the future Arctic, as long as decision makers set aside the habitat that they need. This is an excerpt from Edward Struzik's new book "Future Arctic: Field Notes from a World on the Edge," published by Island Press.